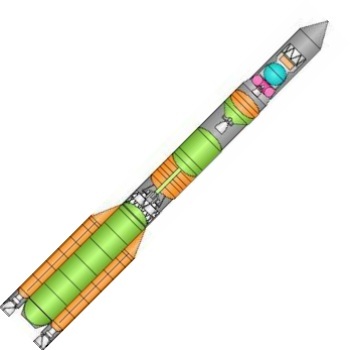 Proton 8K82K / 11S86 Block DM launch vehicle - cutaway drawing showing arrangement of N2O4 oxidiser tanks (green) and UDMH fuel tanks (orange) in Proton, and Liquid oxygen (blue) and kerosene (pink) tanks in the Block DM stage. Block DM guidance package is housed in the light brown compartment above the LOX tank. Version of Proton using Block DM-5 / 17S40 fourth stage. This stage has a new payload adapter for use with heavier payloads launched into sub-synchronous orbits. Used for launch of Arkon reconnaissance satellite. AKA: 8K82K / 17S40;D-1e;Proton / Block DM-5;SL-12;UR-500K. Status: Retired 2002. First Launch: 1997-06-06. Last Launch: 2002-10-17. Number: 6 . Payload: 6,000 kg (13,200 lb). Thrust: 8,847.00 kN (1,988,884 lbf). Gross mass: 708,410 kg (1,561,770 lb). Height: 59.00 m (193.00 ft). Diameter: 4.15 m (13.61 ft). Span: 7.40 m (24.20 ft). Apogee: 1,500 km (900 mi). LEO Payload: 6,000 kg (13,200 lb) to a 1,500 km orbit at 63.00 degrees. Launch Price $: 70.000 million in 1994 dollars. Stage 1. 1 x Proton K-1. Gross Mass: 450,510 kg (993,200 lb). Empty Mass: 31,100 kg (68,500 lb). Thrust (vac): 10,470.158 kN (2,353,785 lbf). Isp: 316 sec. Burn time: 124 sec. Isp(sl): 267 sec. Diameter: 4.15 m (13.61 ft). Span: 7.40 m (24.20 ft). Length: 21.20 m (69.50 ft). Propellants: N2O4/UDMH. No Engines: 6. Engine: RD-253-11D48. Other designations: 8S810K. Status: In Production. Stage 2. 1 x Proton K-2. Gross Mass: 167,828 kg (369,997 lb). Empty Mass: 11,715 kg (25,827 lb). Thrust (vac): 2,399.216 kN (539,365 lbf). Isp: 327 sec. Burn time: 206 sec. Isp(sl): 230 sec. Diameter: 4.15 m (13.61 ft). Span: 4.15 m (13.61 ft). Length: 14.00 m (45.00 ft). Propellants: N2O4/UDMH. No Engines: 4. Engine: RD-0210. Other designations: 8S811K. Status: In Production. Stage 3. 1 x Proton K-3. Gross Mass: 50,747 kg (111,877 lb). Empty Mass: 4,185 kg (9,226 lb). Thrust (vac): 630.170 kN (141,668 lbf). Isp: 325 sec. Burn time: 238 sec. Isp(sl): 230 sec. Diameter: 4.15 m (13.61 ft). Span: 4.15 m (13.61 ft). Length: 6.50 m (21.30 ft). Propellants: N2O4/UDMH. No Engines: 1. Engine: RD-0212. Status: In Production. Stage 4. 1 x Proton 17S40. Gross Mass: 14,600 kg (32,100 lb). Empty Mass: 3,300 kg (7,200 lb). Thrust (vac): 85.020 kN (19,113 lbf). Isp: 352 sec. Burn time: 450 sec. Diameter: 3.70 m (12.10 ft). Span: 3.70 m (12.10 ft). Length: 7.10 m (23.20 ft). Propellants: Lox/Kerosene. No Engines: 1. Engine: RD-58M. Other designations: Block DM; D-1-e. Status: In Production. Also known as Block DM-5. Commercial version is Block DM2, with Iridium dispenser, designed for insertion of multiple LM 700 (Iridium) spacecraft into medium earth orbit. With guidance unit, modification of 11S861 stage for heavier payloads and with different payload adapter. Family: orbital launch vehicle. Country: Russia. Engines: RD-0210, RD-0212, RD-58M, RD-253-11D48. Spacecraft: LM 700, Arkon-1, Integral. Projects: Iridium. 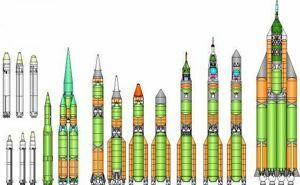 Launch Sites: Baikonur, Baikonur LC81/23, Baikonur LC81/24, Baikonur LC200/39. Agency: Chelomei bureau. 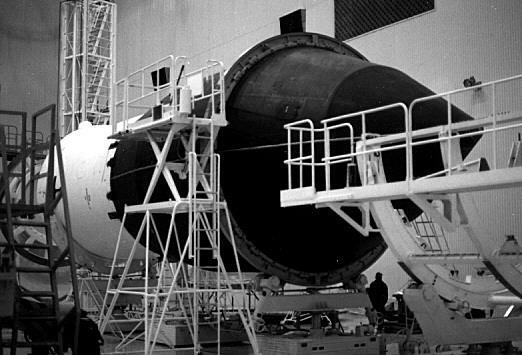 Proton Iridium payload preparation in former Buran payload facility. 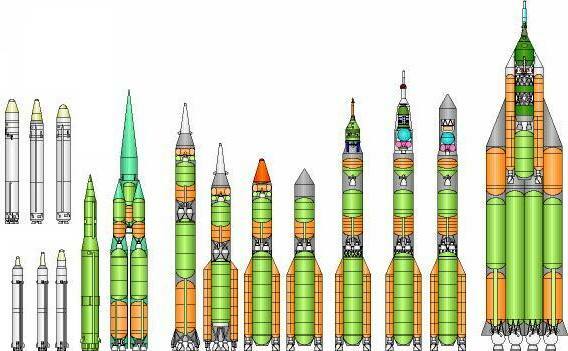 Chelomei's Universal Rocket Family. From left to right: UR-100 (three variants) and UR-100N (three variants). UR-200. Original UR-500 configuration, composed of clustered UR-200's. Conventional UR-500 monoblock configuration. Selected UR-500 polyblock configuration. UR-500 two-stage configuration - ICBM version and as flown. UR-500K configuration with LK-1; with Block D upper stage and L1; with Block D upper stage for satellite launch. UR-700. 1997 June 6 - . 16:56 GMT - . Launch Site: Baikonur. Launch Complex: Baikonur LC200/39. LV Family: Proton. 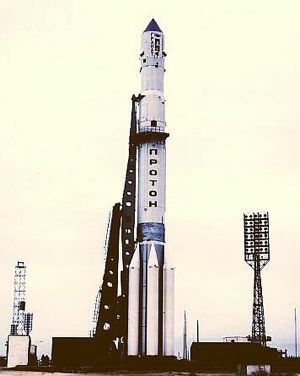 Launch Vehicle: Proton-K/17S40. Cosmos 2344 - . Payload: Arkon-1 s/n 1. Mass: 6,000 kg (13,200 lb). Nation: Russia. Agency: MO. Manufacturer: Lavochkin bureau. Class: Surveillance. Type: Military surveillance satellite. Spacecraft: Arkon-1. USAF Sat Cat: 24827 . COSPAR: 1997-028A. Apogee: 2,739 km (1,701 mi). Perigee: 1,502 km (933 mi). Inclination: 63.40 deg. Period: 130.00 min. First launch in a new series of electro-optical military reconnaisance satellites. .
1997 June 18 - . 14:02 GMT - . Launch Site: Baikonur. Launch Complex: Baikonur LC81/23. LV Family: Proton. Launch Vehicle: Proton-K/17S40. Iridium 14 - . Payload: Iridium s/n SV014. Mass: 689 kg (1,518 lb). Nation: USA. Agency: Iridium. Manufacturer: Lockheed, Motorola. Program: Iridium. Class: Communications. Type: Civilian communications satellite. Spacecraft: LM 700. USAF Sat Cat: 24836 . COSPAR: 1997-030A. Apogee: 778 km (483 mi). Perigee: 776 km (482 mi). Inclination: 86.39 deg. Period: 100.40 min. Plane 5. Ascending node 294.2 degrees. Not in service..
Iridium 11 - . Payload: Iridium s/n SV011. Mass: 689 kg (1,518 lb). Nation: USA. Agency: Iridium. Manufacturer: Lockheed, Motorola. Program: Iridium. Class: Communications. Type: Civilian communications satellite. Spacecraft: LM 700. USAF Sat Cat: 24842 . COSPAR: 1997-030G. Apogee: 774 km (480 mi). Perigee: 749 km (465 mi). Inclination: 86.44 deg. Period: 100.07 min. Plane 5. Ascending node 294.6 degrees. Not in service..
Iridium 16 - . Payload: Iridium s/n SV016. Mass: 689 kg (1,518 lb). Nation: USA. Agency: Iridium. Manufacturer: Lockheed, Motorola. Program: Iridium. Class: Communications. Type: Civilian communications satellite. Spacecraft: LM 700. USAF Sat Cat: 24841 . COSPAR: 1997-030F. Apogee: 779 km (484 mi). Perigee: 776 km (482 mi). Inclination: 86.40 deg. Period: 100.40 min. Plane 5. Ascending node 294.2 degrees..
Iridium 13 - . Payload: Iridium s/n SV013. Mass: 689 kg (1,518 lb). Nation: USA. Agency: Iridium. Manufacturer: Lockheed, Motorola. Program: Iridium. Class: Communications. Type: Civilian communications satellite. Spacecraft: LM 700. Decay Date: 2018-04-29 . USAF Sat Cat: 24840 . COSPAR: 1997-030E. Apogee: 780 km (480 mi). Perigee: 776 km (482 mi). Inclination: 86.40 deg. Period: 100.40 min. Plane 5. Ascending node 294.2 degrees..
Iridium 9 - . Payload: Iridium s/n SV009. Mass: 689 kg (1,518 lb). Nation: USA. Agency: Iridium. Manufacturer: Lockheed, Motorola. Program: Iridium. Class: Communications. Type: Civilian communications satellite. Spacecraft: LM 700. Decay Date: 2003-03-11 . USAF Sat Cat: 24838 . COSPAR: 1997-030C. Apogee: 779 km (484 mi). Perigee: 775 km (481 mi). Inclination: 86.40 deg. Period: 100.40 min. Plane 5. Ascending node 294.2 degrees..
Iridium 12 - . Payload: Iridium s/n SV012. Mass: 689 kg (1,518 lb). Nation: USA. Agency: Iridium. Manufacturer: Lockheed, Motorola. Program: Iridium. Class: Communications. Type: Civilian communications satellite. Spacecraft: LM 700. Decay Date: 2018-09-02 . USAF Sat Cat: 24837 . COSPAR: 1997-030B. Apogee: 780 km (480 mi). Perigee: 776 km (482 mi). Inclination: 86.40 deg. Period: 100.40 min. Plane 5. Ascending node 294.2 degrees..
Iridium 10 - . Payload: Iridium s/n SV010. Mass: 689 kg (1,518 lb). Nation: USA. Agency: Iridium. Manufacturer: Lockheed, Motorola. Program: Iridium. Class: Communications. Type: Civilian communications satellite. Spacecraft: LM 700. Decay Date: 2018-10-06 . USAF Sat Cat: 24839 . COSPAR: 1997-030D. Apogee: 780 km (480 mi). Perigee: 776 km (482 mi). Inclination: 86.40 deg. Period: 100.40 min. Plane 5. Ascending node 294 degrees..
1997 September 14 - . 01:36 GMT - . Launch Site: Baikonur. Launch Complex: Baikonur LC81/23. LV Family: Proton. Launch Vehicle: Proton-K/17S40. Iridium 29 - . Payload: Iridium s/n SV029. Mass: 689 kg (1,518 lb). Nation: USA. Agency: Iridium. Manufacturer: Lockheed, Motorola. Program: Iridium. Class: Communications. Type: Civilian communications satellite. Spacecraft: LM 700. USAF Sat Cat: 24944 . COSPAR: 1997-051A. Apogee: 779 km (484 mi). Perigee: 776 km (482 mi). Inclination: 86.40 deg. Period: 100.40 min. Plane 3. Ascending node 230.9 degrees..
Iridium 27 - . Payload: Iridium s/n SV027. Mass: 689 kg (1,518 lb). Nation: USA. Agency: Iridium. Manufacturer: Lockheed, Motorola. Program: Iridium. Class: Communications. Type: Civilian communications satellite. Spacecraft: LM 700. Decay Date: 2002-02-01 . USAF Sat Cat: 24947 . COSPAR: 1997-051D. Apogee: 553 km (343 mi). Perigee: 542 km (336 mi). Inclination: 86.65 deg. Period: 95.61 min. Plane 3. Ascending node 223.2 degrees. Failed in low orbit..
Iridium 28 - . Payload: Iridium s/n SV028. Mass: 689 kg (1,518 lb). Nation: USA. Agency: Iridium. Manufacturer: Lockheed, Motorola. Program: Iridium. Class: Communications. Type: Civilian communications satellite. Spacecraft: LM 700. USAF Sat Cat: 24948 . COSPAR: 1997-051E. Apogee: 779 km (484 mi). Perigee: 776 km (482 mi). Inclination: 86.40 deg. Period: 100.40 min. Plane 3. Ascending node 230.9 degrees..
Iridium 31 - . Payload: Iridium s/n SV031. Mass: 689 kg (1,518 lb). Nation: USA. Agency: Iridium. Manufacturer: Lockheed, Motorola. Program: Iridium. Class: Communications. Type: Civilian communications satellite. Spacecraft: LM 700. Decay Date: 2018-12-20 . USAF Sat Cat: 24950 . COSPAR: 1997-051G. Apogee: 779 km (484 mi). Perigee: 776 km (482 mi). Inclination: 86.40 deg. Period: 100.40 min. Plane 3. Ascending node 230.9 degrees..
Iridium 32 - . Payload: Iridium s/n SV032. Mass: 689 kg (1,518 lb). Nation: USA. Agency: Iridium. Manufacturer: Lockheed, Motorola. Program: Iridium. Class: Communications. Type: Civilian communications satellite. Spacecraft: LM 700. USAF Sat Cat: 24945 . COSPAR: 1997-051B. Apogee: 779 km (484 mi). Perigee: 776 km (482 mi). Inclination: 86.40 deg. Period: 100.40 min. Plane 3. Ascending node 230.9 degrees..
Iridium 30 - . Payload: Iridium s/n SV030. Mass: 689 kg (1,518 lb). Nation: USA. Agency: Iridium. Manufacturer: Lockheed, Motorola. Program: Iridium. Class: Communications. Type: Civilian communications satellite. Spacecraft: LM 700. Decay Date: 2017-09-28 . USAF Sat Cat: 24949 . COSPAR: 1997-051F. Apogee: 780 km (480 mi). Perigee: 776 km (482 mi). Inclination: 86.40 deg. Period: 100.40 min. Plane 3. Ascending node 230.8 degrees..
Iridium 33 - . Payload: Iridium s/n SV033. Mass: 689 kg (1,518 lb). Nation: USA. Agency: Iridium. Manufacturer: Lockheed, Motorola. Program: Iridium. Class: Communications. Type: Civilian communications satellite. Spacecraft: LM 700. USAF Sat Cat: 24946 . COSPAR: 1997-051C. Apogee: 778 km (483 mi). Perigee: 776 km (482 mi). Inclination: 86.40 deg. Period: 100.40 min. Plane 3. Ascending node 230.9 degrees. Active when it collided with Cosmos 2251 at 16:56 GMT on 10 February 2009, destroying both satellites and creating a debris cloud im MEO..
1998 April 7 - . 02:13 GMT - . Launch Site: Baikonur. Launch Complex: Baikonur LC81/23. LV Family: Proton. Launch Vehicle: Proton-K/17S40. Iridium 62 - . Payload: Iridium s/n SV062. Mass: 689 kg (1,518 lb). Nation: USA. Agency: Iridium. Manufacturer: Lockheed, Motorola. Program: Iridium. Class: Communications. Type: Civilian communications satellite. Spacecraft: LM 700. Decay Date: 2018-11-07 . USAF Sat Cat: 25285 . COSPAR: 1998-021A. Apogee: 778 km (483 mi). Perigee: 776 km (482 mi). Inclination: 86.40 deg. Period: 100.40 min. Plane 1. Ascending node 167.9 degrees..
Iridium 66 - . Payload: Iridium s/n SV066. Mass: 689 kg (1,518 lb). Nation: USA. Agency: Iridium. Manufacturer: Lockheed, Motorola. Program: Iridium. Class: Communications. Type: Civilian communications satellite. Spacecraft: LM 700. Decay Date: 2018-08-23 . USAF Sat Cat: 25289 . COSPAR: 1998-021E. Apogee: 779 km (484 mi). Perigee: 776 km (482 mi). Inclination: 86.40 deg. Period: 100.40 min. Plane 1. Ascending node 167.8 degrees..
Iridium 67 - . Payload: Iridium s/n SV067. Mass: 689 kg (1,518 lb). Nation: USA. Agency: Iridium. Manufacturer: Lockheed, Motorola. Program: Iridium. Class: Communications. Type: Civilian communications satellite. Spacecraft: LM 700. Decay Date: 2018-07-02 . USAF Sat Cat: 25290 . COSPAR: 1998-021F. Apogee: 779 km (484 mi). Perigee: 776 km (482 mi). Inclination: 86.40 deg. Period: 100.40 min. Plane 1. Ascending node 167.8 degrees..
Iridium 65 - . Payload: Iridium s/n SV065. Mass: 689 kg (1,518 lb). Nation: USA. Agency: Iridium. Manufacturer: Lockheed, Motorola. Program: Iridium. Class: Communications. Type: Civilian communications satellite. Spacecraft: LM 700. Decay Date: 2018-07-19 . USAF Sat Cat: 25288 . COSPAR: 1998-021D. Apogee: 778 km (483 mi). Perigee: 776 km (482 mi). Inclination: 86.40 deg. Period: 100.40 min. Plane 1. Ascending node 167.9 degrees..
Iridium 64 - . Payload: Iridium s/n SV064. Mass: 689 kg (1,518 lb). Nation: USA. Agency: Iridium. Manufacturer: Lockheed, Motorola. Program: Iridium. Class: Communications. Type: Civilian communications satellite. Spacecraft: LM 700. USAF Sat Cat: 25287 . COSPAR: 1998-021C. Apogee: 779 km (484 mi). Perigee: 776 km (482 mi). Inclination: 86.40 deg. Period: 100.40 min. Plane 1. Ascending node 167.6 degrees..
Iridium 63 - . Payload: Iridium s/n SV063. Mass: 689 kg (1,518 lb). Nation: USA. Agency: Iridium. Manufacturer: Lockheed, Motorola. Program: Iridium. Class: Communications. Type: Civilian communications satellite. Spacecraft: LM 700. USAF Sat Cat: 25286 . COSPAR: 1998-021B. Apogee: 779 km (484 mi). Perigee: 776 km (482 mi). Inclination: 86.40 deg. Period: 100.40 min. Plane 1. Ascending node 167.8 degrees..
Iridium 68 - . Payload: Iridium s/n SV068. Mass: 689 kg (1,518 lb). Nation: USA. Agency: Iridium. Manufacturer: Lockheed, Motorola. Program: Iridium. Class: Communications. Type: Civilian communications satellite. Spacecraft: LM 700. Decay Date: 2018-06-06 . USAF Sat Cat: 25291 . COSPAR: 1998-021G. Apogee: 779 km (484 mi). Perigee: 776 km (482 mi). Inclination: 86.40 deg. Period: 100.40 min. The Proton launch vehicle placed the Iridium cluster and the Block DM2 stage into low parking orbit. The DM2 fired twice to enter the deployment orbit and dispensed the seven satellites, which used their own propulsion units to reach operational altitude. The DM2 stage then fired again to deorbit itself, to avoid creating space debris. SV068 placed in Plane 1. Ascending node 167.8 degrees. 2002 July 25 - . 15:13 GMT - . Launch Site: Baikonur. Launch Complex: Baikonur LC81/24. LV Family: Proton. Launch Vehicle: Proton-K/17S40. Cosmos 2392 - . Mass: 2,600 kg (5,700 lb). Nation: Russia. Class: Surveillance. Type: Military surveillance satellite. Spacecraft: Arkon-1. USAF Sat Cat: 27470 . COSPAR: 2002-037A. Apogee: 1,774 km (1,102 mi). Perigee: 1,506 km (935 mi). Inclination: 63.50 deg. Period: 119.10 min. This was the second launch of the Arkon-1 electro-optical reconnaissance. The 17S40 Blok DM5 upper stage and satellite were placed by the Proton into a parking orbit. The DM then made two burns to place the satellite in its 1500 x 1836 km x 64.4 deg operational orbit.